Now on view in the lower level Claire Davidson Siegel Gallery is Visions of Scenic Long Island, a solo exhibition featuring the artwork of Robert T. Bloom. The selection of works portray scenic landscapes and seascapes across Nassau and Suffolk County. Bloom calls his work “photographic art,” a multidisciplinary process that combines photography and computer facilitated painting. Each image depicts idealized representations of their respective environments. 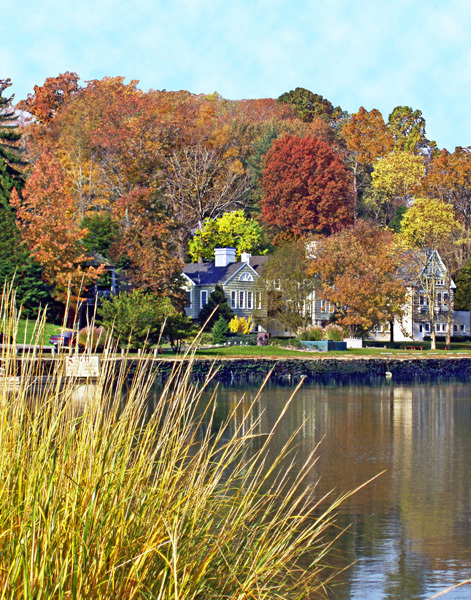 One work on display, Fall Spectacle III, depicts a breathtaking view from the waterside Cold Spring Harbor Lab. Bloom fills his composition with light that reflects off the shrubbery in the foreground through the landscape in the background. The light also exaggerates the extraordinary, changing color of the fall leaves. The juxtaposition of warm and cool colors, paired with the clarity of atmosphere evokes a calm, tranquil feeling within the viewer. Another work on display is Fishing Boat Hamlet. The photo depicts a claiming day at Hobart Beach in Eaton’s Neck, NY. 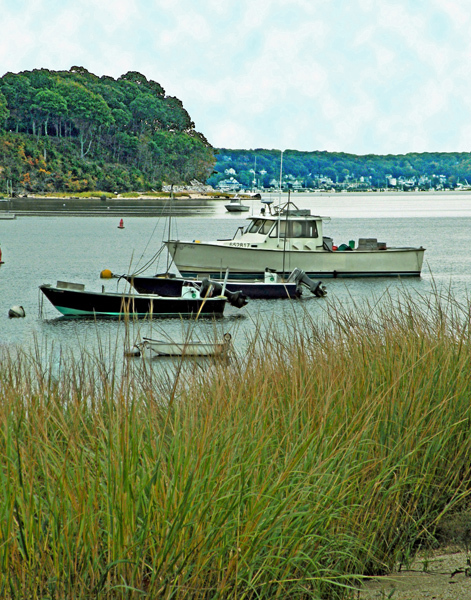 In this image, Bloom, again, enhances the overall lighting of the piece, which allows him to enhance the details of the distant trees, shrubbery in the foreground, and drifting boats. The picture is open and inviting, like the rest of Bloom’s work. Robert T. Bloom is a fine artist from Long Island, NY. His artwork has been exhibited across Long Island with select exhibitions at the Art League of Long Island, Adelphi University, and BACCA Performing Arts Center. Additionally, Bloom’s artwork has been extensively surveyed across numerous public libraries, community centers, and universities throughout Long Island. To see more artwork by Bloom, visit www.picturetrail.com/robertbloom and www.yessy.com. Visions of Scenic Long Island, featuring the artwork of Robert T. Bloom, is on display at the Patchogue-Medford Library now through October 31 in the lower level Claire Davidson Siegel Gallery.